I thought we were past the stage of tricky purples in nail polish, but I guess not. Those of you who have been on the nail polish scene for awhile will remember how when brands attempted to neon purples some of them would look purple in the bottle, but more pink on the nail. Plus, they'd photograph funky and have weird formulas. Well, China Glaze last summer gave us a tricky purple. Violet Vibes is a medium bright grape purple creme/jelly(?). Color: This is one of those purples that looks more purple on the bottle, but looks more pink on the nail. 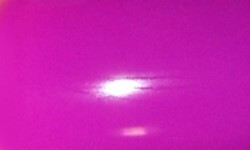 It also photographs more pink than it is, but it's still really more pink than purple? That makes no sense, but this is just one of those weird purple polishes that is just weird. I know that's such helpful commentary. Formula: Ugh. What is this? This has this weird thin, jelly like formula that dries all uneven and matte. I used 3 coats above. It's not a pleasant formula to work with. I rarely comment on wear time, but I will on this one. I have this on my toes. I usually can wear a pedicure color 3-4 weeks with out any wear or chips before I have to change it. This chipped on my toes in less than a week. Not just one chip or a tiny chip. This chipped off in chunks on multiple nails. Price: You can find this on e-tailers in the $3.50-$7.00 range. Overall: Nope. The color isn't bad. It's pretty despite it not really being the color I expected. The formula is what really kills this polish. It's exactly the same type of terrible formula "neon" purples like this have had in the past. Sinful Colors Dream On would be a prime comparison and example as far as what type of polish this is like. I'm not impressed.